One of the perks of owning a used and collectible bookstore is having the opportunity to interact with great books. Historically important books, books that inspire nostalgic wonder, visually stunning books… books that have a meaning beyond what lies between their covers. 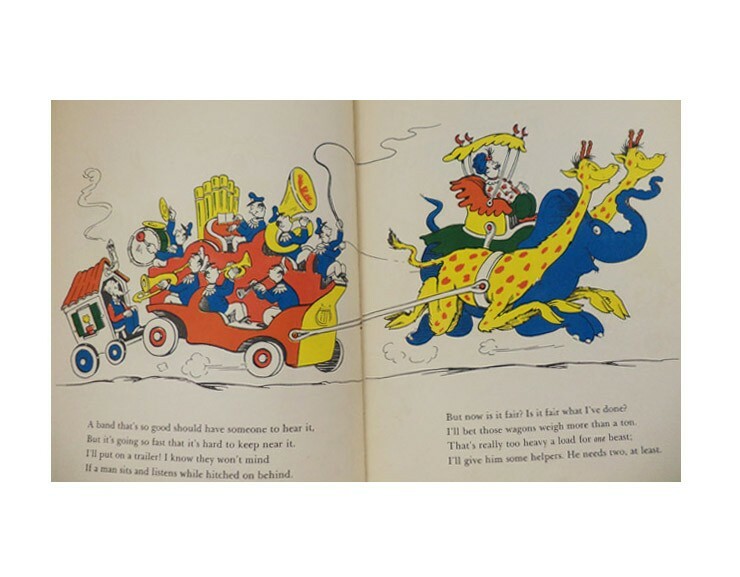 Today I’ll feature just one of these, recently acquired: a first edition of Dr. Seuss’s first children’s book, And To Think That I Saw It On Mulberry Street. What many don’t know is that this book was not an instant hit. It was rejected for publication by dozens of publishers (the exact count is different depending who you ask). Seuss almost incinerated the manuscript. The significance of this book (and other Seuss titles) has not gone unnoticed in the collecting world. First edition copies in the (scarce) original dust jacket often have asking prices in the mid-four-figure range. There is a bibliography entirely dedicated to identification of Seuss first editions — Younger & Hirsch’s ‘First Editions of Dr. Seuss Books: A Guide to Identification’ (which, by the way, is extremely detailed and helpful – I signed copy of it has a permanent spot in my reference library). This story in particular is a great example of the power of the imagination. The story follows a young boy named Marco, and his fantastical depiction of a series of events taking place on Mulberry Street (named for a real street located near Seuss’s boyhood home in Springfield, Massachusetts). Seuss’s colorful illustrations draw us into a world that exists only in the mind of an imaginative, imaginary child. But the book allows that unreal world to live forever, because we can each remember it in our own way, and take it with us through our own lives, returning to it when we return to memories of our own childhoods. It is truly an amazing achievement, and a reminder of how powerful books can be. or better yet, stop by the shop to see it!